PLATTSBURGH, N.Y. (Nov. 12, 2009) - Visiting Bowdoin College and No. 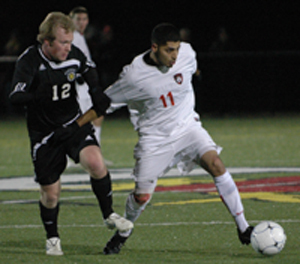 19-NSCAA ranked SUNY Plattsburgh battled to a scoreless double-overtime tie on Thursday at Cardinals Field House Complex, but the host Cardinals captured the penalty kick shootout, 6-5, to advance to the second round of the NCAA Division III Men's Soccer Championship. The Polar Bears end their season with an 11-4-2 overall record. The Cardinals will bring a 13-2-6 mark into Sunday's 1 p.m. showdown at No. 8 Rochester, which received a first-round bye. Thursday night marked the 500th game for Chris Waterbury as coach at SUNY Plattsburgh, which has compiled 499 wins since the program was founded in 1950. Waterbury has a 347-105-48 school ledger in 25 years at the Cardinals helm. Freshman Mike Payne scored on Plattsburgh's final attempt in the shootout, kicking the ball down the center to outguess the goalkeeper who went to his left. That scene was set up by Plattsburgh goalie Andy Heighington who had a kick-save on Daniel Chaffetz. Bowdoin had a one-goal lead in the shootout until the fifth round when Plattsburgh got back in it as Heighington stopped Eddie Jones, who had a chance to put the Polar Bears in the next round. John Martin roofed his attempt to make it 5-5, the teams traded good attempts and then Plattsburgh won it in the seventh round. Plattsburgh outshot Bowdoin 12-7, including 9-4 in the second half, but neither defense caved in. The Polar Bears had a slight edge in corner kicks, 5-3. The best scoring chance for either side came in the 57th minute when Call Nichols' header was punched over the crossbar by Heighington, who finished with six saves. Dan Hicks had three saves for Bowdoin. The Cardinals, who are now 2-3 all-time in NCAA tournament penalty kick shootouts, win their first such event since 1992.